Archer on Airguns: New, Old Stock B4-1/TS45 Vintage Shanghai Air Rifles. New, Old Stock B4-1/TS45 Vintage Shanghai Air Rifles. Archer Airguns has a very small number of these vintage side lever air rifles available, manufactured by Shanghai Airguns Company. This is the side lever B4-1 air rifle. These are "new, old" stock guns that were manufactured in 2004 but have sat in a warehouse since then. The boxes are marked B4-1/TS45. These are sold "as is" with no warranty but will be test fired to confirm functionality. The packaging says that pellets are included, but we've thrown these away as they were of very poor quality. Instead, they are supplied with 2 spare breech seals in case the original is in less than perfect condition. These guns have stocks with rubber buttpads and a reasonable color varnish - not the legendary virulent orange of really old Shanghai guns. The wood is "2004 good", with no, or minimal cracks. There may be a little filler and a few slight dings. These stocks are very serviceable and will refinish well if you like a project. The metal may have a little surface rust from storage, but the bluing is generally good. The original boxes and instruction sheets are in excellent condition. They are surprisingly heavy, all wood and metal construction. 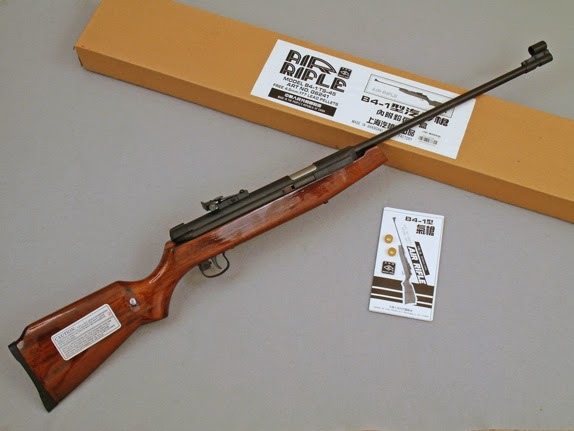 There are also a few B4-1 air rifle seconds with poor wood having "non-lethal" cracks, dings or filler that would look great with a bedliner refinish. Available in .22 caliber only, the example we test fired achieved 505fps over the Chrony using 13.9 Grain Peak wadcutters, with good consistency and just a little smoke. There's an interesting manual safety inside the trigger guard that's primitive but seems to work well. These guns shoot, but they will benefit from some care and attention from a new owner. Replacing the breech seals and some concern for the leather piston seal would be in order. Of course Archer Airguns has additional breech seals and piston seals available. If you love these vintage Chinese airguns, this is a "one time only" offer. When these are gone, we have no more. I know that there is collector interest in these vintage air rifles, so thought I'd mention them here.